What Will Become of Land-Grant Universities? I am reminded virtually daily of the monumental changes sweeping across the campuses of Auburn University and other land-grant schools. I’m reminded of it whenever I encounter a student-driven Land Rover, Lexus, or BMW — needless to say, virtually an hourly occurrence —or pass an Auburn student ambassador valiantly struggling to explain the land-grant function to prospective students. Who would have imagined that Auburn and other so-called “people’s universities” — the 70 or so agricultural and mechanical universities established by the Morrill Act of 1862 to lift the farming and working classes into the ranks of the middle classes — would undergo such sweeping transformations in their own right? A few generations ago, who among the gentrified students of chartered state schools who mercilessly denigrated these schools as cow colleges could have imagined that future students of these institutions would turn out to be as upscale and as worldly as they? For someone like me, a longstanding employee and admirer of Cooperative Extension and the land-grant legacy in general, this raises an intriguing, if not troubling, question: What do all these changes mean for future of the land-grant university concept? Is land-grant destined to become an endearing but largely empty term carried by schools in much the same way that “Her Majesty’s Ship” is borne by British and some Commonwealth naval vessels — a respectful nod to continuity and tradition but little more than that? University of Minnesota faculty member Bill Gleason explores these questions in a recent edition of The Chronicle of Higher Education. “Land-grant universities should get back to the business of doing what they do best — in particular, teaching at a level sufficient to prepare people in their states to be competitive in the job market — and worry less about becoming world-class public research institutions,” he writes. Isn’t it enough to prepare ordinary Minnesotans for the challenges of life, even while ensuring that the occasional outlier is fully equipped to take his or her place among this nation’s elite? “Public education should be the great equalizer, and Minnesota and other land-grant institutions should return to their original land-grant priorities,” he contends. I respect Dr. Gleason’s candor and forthrightness. Yet, I suspect even he would acknowledge the myriad of centrifugal forces that are pulling land-grant universities in the opposite direction. Many of these influences stem from deeply rooted causes. From the very beginning of the American Republic there was the expectation among newly established frontier states that they were as much entitled to the accoutrements of statehood as the original 13 states. If Massachusetts, Connecticut and New Jersey possessed first-class universities, then, by God, Kentucky, Tennessee and Ohio were entitled to them too. Funding arguably constitutes the strongest centrifugal force of all. 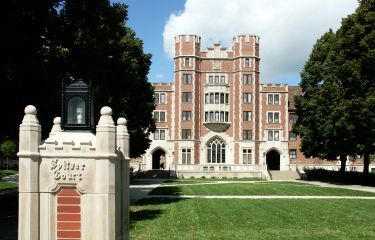 With steady declines in state funding projected for the foreseeable future, flagship universities, whether state chartered or land-grant, have every incentive to develop honors colleges to attract topnotch talent in the hope that these future entrepreneurs and corporate CEOs will contribute substantially to alumni endowments. I can’t even begin to relate how the emerging global economy will exert an increasingly centrifugal pull in the future. Granted, there are centripetal forces at work too. State funding still accounts for a big share of land-grant university funding. As Gleason contends, Minnesota, by reaffirming its land-grant university status, could make a strong case for enhanced state funding. Even so, I’m betting that centrifugal forces ultimately win out. A kind of evolution within form already is well under way at many of these institutions as they undergo a subtle transformation from historic state land-grant school to globally-engaged technological university. As I see it, very few centripetal forces remain to draw these institutions back to their land-grant roots. Two other powerful centrifugal forces in U.S. higher education have been almost entirely overlooked: former state teacher colleges, which, for the most part, now function as regional universities, and two-year community colleges. Many of these schools already operate community-wide and even regional outreach/Extension programs focused on economic development and social welfare issues. Some regional universities, including my own alma mater, are even negotiating to acquire many of the applied technical programs that many technological universities desperately want to jettison. Is it possible that many, if not most, of these land-grant functions will ultimately devolve to these schools, especially as historic land-grant universities shed these traditional roles? As I see it, that remains an open question. Still, I’m old enough to realize that no institutional arrangement is sacrosanct, especially in these changing times.